Description: Tiny flowers, 6–75 in a cluster on a leafless weak stem. Each flower with 6 segments/petals. Petals are lanceolate to ovate, dark red-purple to white. Leaf: 1.5–2 X stem, hollow cylindric single leaf curled close to the ground. Range: California — s North Coast Ranges, s Sierra Nevada Foothills, Tehachapi Mountain Area, Central Western California, Southwestern California, East of Sierra Nevada, Desert. Distribution outside California — n Baja California. Habitat: Dry slopes and flats and can be found in a variety of plant communities including, but not limited to, Creosote Bush Scrub, Joshua Tree Woodland, Pinyon-Juniper Woodland, Chaparral. 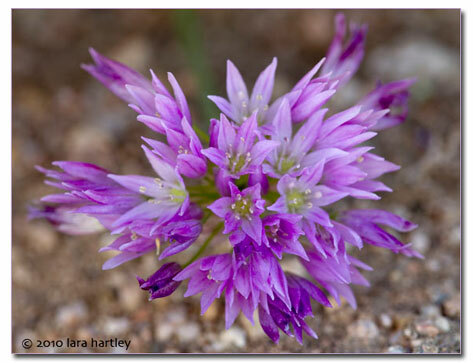 Notes: Common perennial bulb forb/herb that is native to California and is found only slightly beyond California borders. The plant has a heavy onion smell and was used by Indians for food. 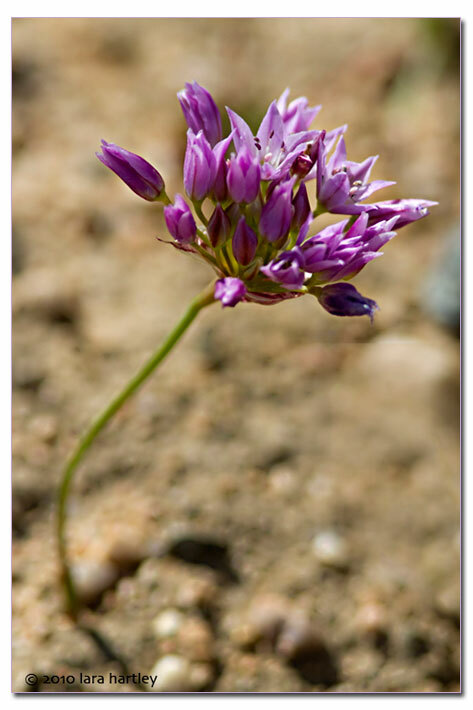 This example was found in great profusion on the gravely and sandy flats in Creosote Bush Scrub off Highway 395 on Haiwee Power Plant Road, Kern County, California. Photographed May 2010. Photos tips More on desert photography.